My personal definition of science fiction, or at least good science fiction, is the use of plausible yet not quite real scientific concepts and innovation as a vehicle to investigate questions about and reveal fundamental truths of the human condition. 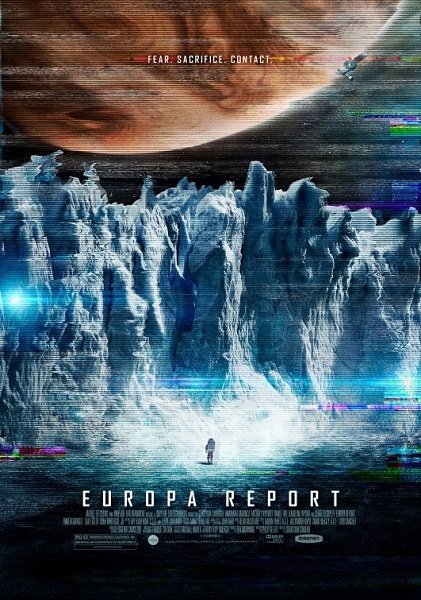 If you agree with that description, then you may also agree that Europa Report is be the finest science fiction film of the year thus far and belongs on a very short list for the best in the genre for the past decade. The only other film I can think of that comes close to matching it in 2013 is Shane Carruth's beautifully obtuse Upstream Color. It's telling that in a summer full of big-budget sci-fi films where things crash and crumble, two films made for a fraction of the cost demonstrate how ideas can be far more devastating than explosions. For a change, the stakes are not the survival of humanity but its intellectual development, as the private-funded Europa One mission attempts to push the boundaries of human exploration by traveling to Europa, an icy moon of the gas giant Jupiter. Scientists have theorized that a liquid ocean might exist under the moon's frozen shell, an ocean that might contain our best chance of discovering extraterrestrial life, even if it's only at the cellular level. This is one of the big questions that Europa One has set out to investigate. 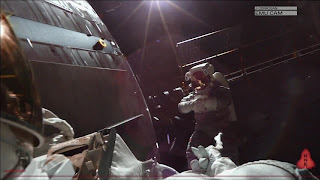 The events of the mission are presented to us as footage from the multiple cameras recording every minute of the flight, intercut with interviews with the Earth-bound scientists monitoring the progress of the astronauts. At least, until the midpoint of the voyage, at which time the multinational crew suddenly loses all contact with Earth. It's only the first of many complications that will endanger their mission and leave them facing the difficult choice of just how much they're willing to risk to accomplish their scientific goals. 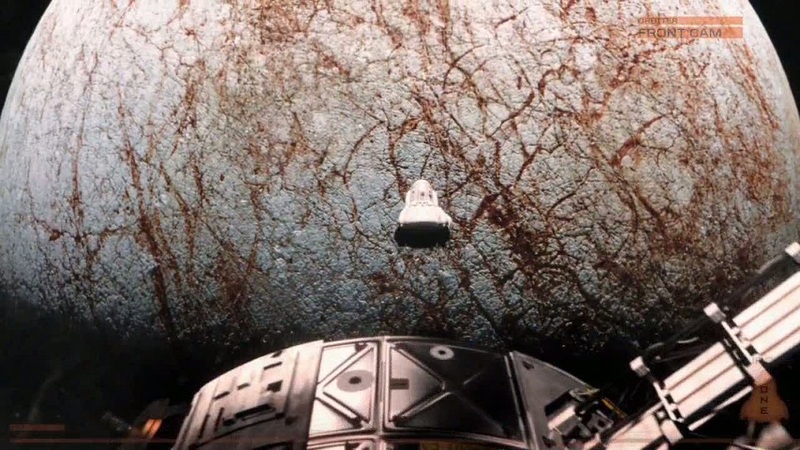 One of the most notable attributes of Europa Report and something that is unfortunately rare in the genre is its lionization of scientific discovery for its own sake. There are plenty of sci-fi films in which science is the catalyst for terror and destruction, as mankind ventures into areas that we are sanctimoniously informed it was never meant to. There are also many where science and technology are plot devices to set up a premise, whether it's building giant robots to fight giant monsters, designing robotic suits to beat up villains or making a faster warp drive. But here science is not only the means to an end but the end itself. For the crew of Europa One, the tremendous risks they confront aren't to cure a disease or save the planet, but only to add to humanity's collective knowledge about the universe they live in, even if it's only a case of eliminating possibilities. There's a great moment when the mission captain William Xu (Daniel Wu) is asked what happens if they get to Europa and don't find anything. He pragmatically and quite astutely notes that even ruling out the presence of life there would still qualify as a discovery. Considering the unfortunate budget cuts to NASA, it's also heartening to see a story in which a corporately-funded space venture isn't focused on financial gain or the selfish pursuits of executives. The private sector hasn't looked this noble since Destination Moon. 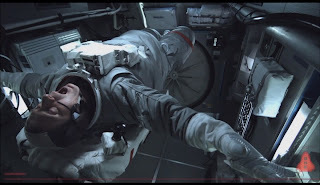 The focus on capturing data makes the decision to frame the story through the mission's flight recorders a canny one and turns the found-footage structure into something more than the gimmick it was in the superficially similar Apollo 18. The video feed we're watching isn't just a dramatic device but also the crux of the story since it's the very material that the crew is struggling so hard to capture and transmit to Earth in the first place. In an aesthetic sense it also works well; most of it is shot from stable camera set-ups and will strike a chord with anyone who's watched footage from a NASA feed. The exterior angles of the ship beautifully convey the terrifying vastness of space and emphasize the immense undertaking the journey represents, as we watch the sun grow smaller and smaller in the rear view while an onscreen counter ticks off the many weeks of mission time going by. That counter comes in handy as the chronology of writer Philip Gelatt's screenplay isn't always straight-forward. We start with the moment that the crew loses communication, then cut in to footage from some time later to find the characters talking around some unknown tragedy that's occurred in the interim. This immediately puts us on the alert that things are going to go awry and inevitably leaves us guessing about the nature of the event in question. When we finally see the missing piece, it's placed in the middle of the second act, which might seems like an odd decision intellectually but makes sense emotionally as it allows the film to kick off its main thematic thrust with one of its most affecting scenes. This relates to another of the film's great qualities; its recognition and upending of genre conventions. 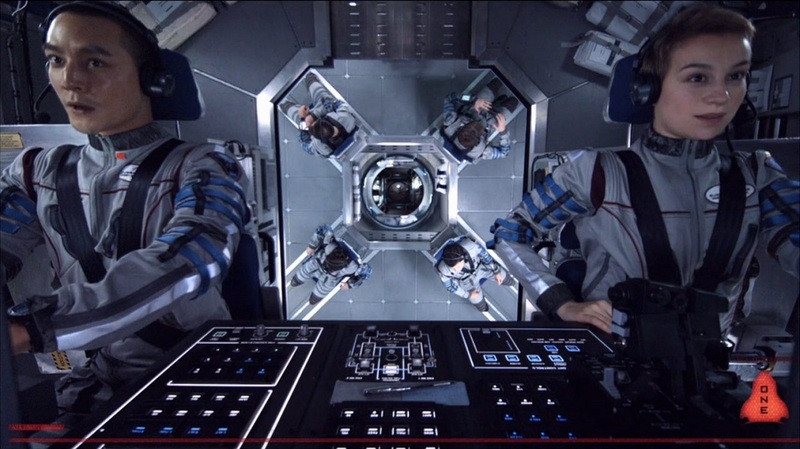 As we watch the crew each dealing with the pressures of their situation, we find ourselves making assumptions about how each is going to behave based what we've seen in other space movies. Virtually every time, the movie changes course toward something different. Similarly, as the crew begins their exploration of Europa in earnest, the tension mounts and it feels like we're taking steps into horror movie territory, but we're never fed cheap scares in the way we're accustomed to. I've talked a lot on this blog about the value of character arcs so it's both refreshing and slightly humbling to see a film that succeeds beautifully without really bothering much about them. 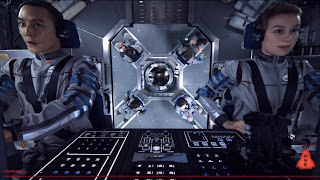 We get a few brief interview segments with the astronauts before launch but their distinct personalities are primarily defined through the choices they make during the mission and their reactions as things go awry, at which point their human frailties begin to clash with the cool professionalism we've come to associate with astronauts. Since the film is structured as an ensemble piece, for much of the running time it feels like any character could be the focus and we never feel secure about anyone's safety. The cast is full of familiar faces, notably sci-fi regular Sharlto Copley as the playful engineer who finds the separation from his family beginning to wear away at his positive outlook, marking another drastic shift in characters for him following his rabid turn in Elysium this same month. Wu exudes steely cool as the mission's level-headed commander and Michael Nyqvist, cast as the mission's edge chief engineer, bounces back from the thinly-written part he was stuck with in the last Mission: Impossible film. Meanwhile Anamaria Marinca and Karolina Wydra make strong impressions as, respectively, the ship's archivist and biologist, two refreshingly active female roles that exemplify the scientific dedication of the mission. Back on Earth, Embeth Davidtz brings a solemnity to the scientist bearing the weight of responsibility for the mission and Dan Fogler, primarily known for comedy, makes for a surprisingly convincing scientist in a bit part. Even Neil deGrasse Tyson shows up in a file footage cameo. His appearance, in which he proposes the very type of mission the film depicts, reflects its efforts toward scientific accuracy. Not since 2001: A Space Odyssey has a fictitious spaceship been conceived with such focus on the practical concerns of space travel. For Europa One, functionality triumphs over the slick aesthetics of other cinematic space vehicles. The ship features a rotating module to provide gravity in the ship's habitation sections, a recycling system to turn urine into a viable water supply and a water shield to protect the crew from exposure to cosmic radiation, all concepts which have proposed for possible use in actual space travel. This commitment to realism extends to the movie's special effects. Despite what is clearly a low-budget, the space exteriors and landscapes of Europa are very realistically rendered, while the scenes set in zero-gravity environments are believable without being overly showy. We're also treated to the voyeuristic thrill of participating in a tense space-walk, the drama of which is greatly enhanced by Battlestar Galactica composer Bear McCreary's nicely understated score which evokes the ominous grandeur of the cosmos. There's a strangely moving moment when Europa One passes beyond the orbit of Earth's moon and by doing so, the crew is informed they have officially gone further than any human ever has. The drive to see what lies beyond has fueled science fiction from its earliest days, when Jules Verne and H.G. Wells sent 19th-century explorers on voyages to the moon. It's the credo of the starship Enterprise, one that seems to have been somewhat forgotten over time. It's the impulse that drove Dave Bowman out of the Discovery for one last fateful voyage. But most importantly, it's the ideal that has led many brave men and women to risk, and sometimes give, their lives to redefine our place in the universe. Europa Report serves as a suspenseful and surprisingly moving reminder that as insignificant as our grasp might be, our reach is heroic.